By Amanda Beckner, CN, HHP, Ph.D.
Digestive conditions are best managed long-term through diet and nutrition. Colitis, acid reflux, diverticulitis, and IBS (irritable bowel syndrome) are conditions with symptoms often managed through medication. While it is unlikely that medication will get to the root of the problem and fix the condition, you can often help your body heal all of these diseases simply by correcting your diet. Symptoms are like a warning light on a dashboard alerting you of ongoing damage. The more pain, the more damage there is. And while medications may alleviate the pain, they may also allow the disease to continue to spread, often resulting in new and different symptoms. That is how one’s medication to treat a condition can multiply into three, four, five or more prescriptions. It is unfortunate, but time after time, I see people locked inside this cycle of symptom and pain management versus disease control. Even though these conditions are different, in holistic healing, they are treated very much the same when it comes to foods to consume and foods to avoid. Let’s consider diverticulitis. Diverticula are pea- or grape-sized protrusions in the intestinal wall. Without sufficient fiber to soften and add bulk, constipation will occur and stools become harder to pass. This pressure creates weak points in the wall of the colon. Symptoms can be mild to chronic and usually are accompanied with sharp pain on the left side of the abdomen, diarrhea, constipation, nausea, and/or bloating. Drinking 64 to 80 ounces of water and consuming adequate amounts of fiber correctly in the diet are essential to controlling this condition. Colitis can quickly turn into diverticulitis if not treated correctly. With colitis, the mucous membrane lining the colon becomes inflamed and develops ulcers which can cause bloody diarrhea, gas, pain, bloating and many times hard stools. When the colon muscles are working extra hard to move the stools, the mucous lining of the colon wall can bulge out into a pouch-like projection (diverticula). A daily dose of papaya and/or peppermint can aid in healing and digestion. Irritable bowel syndrome (also known as spastic colon) can affect the entire gastrointestinal tract from the colon to the mouth and can be accompanied by, or result in, acid reflux. As in the above two conditions, food greatly affects the pain threshold. The normal muscular contractions of the digestive tract become irregular which interferes with the normal movement of food and bowel movements. This in turn leads to the accumulation of mucus and toxins in the intestines which in turn can cause an obstruction in the digestive tract, trapping gas and stools and causing bloating, pain and constipation. Foods to avoid with digestive conditions include alcohol, caffeine, carbonated beverages, red meat, citrus fruits, grapes, some melons, corn, iceberg lettuce, white skinned potato (red skinned potatoes are fine), red tomato (white or purple skinned tomatoes are fine), onion, peppers, cucumber (some conditions can have peeled and cored cucumbers), chocolate, white refined simple carbohydrates and sugars, fried foods, spicy sauces, all dairy products (use rice, coconut, goat, sheep or almond milk, yogurt and cheeses), and nuts and seeds (creamy almond butters or sunflower seed butters are fine). Food additives such as silicon dioxide, magnesium stearate, titanium dioxide, sorbitol, sucralose, mannitol, and food dyes should also be avoided. In severe cases of any of these conditions, wheat and gluten can initially be eliminated and added back once the condition is under control. 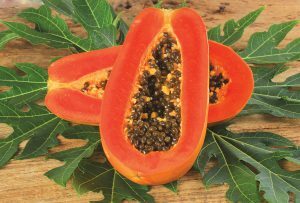 It is recommended that you eat papaya every day as it aids in healing and digestion; peppermint (the herb, not the candy) aids in digestion and healing as well. Remember that water is essential to keep you hydrated and to help the body heal. Drink 64 ounces of healthy, fresh water daily. Dr. Amanda Beckner is owner of Your Body Code, Inc. in Palm Desert which specializes in personalized nutrition and wellness programs. For more information visit www.yourbodycode.com or call (760) 341.BODY (2639).